The iPhone’s circular home button is an iconic piece of design and probably one of the first things most people think of when they think iPhone, but originally another button was apparently going to join it. In a new book titled 'The One Device: The Secret History of the iPhone', it’s revealed that Steve Jobs wanted to add a back button to the iPhone. 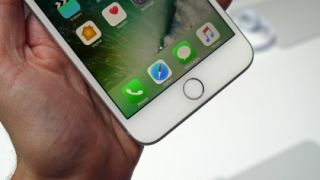 Apparently, ex-Apple designer Imran Chaudhri is responsible for the ditching of the idea, convincing Jobs that to make people trust the iPhone will do what they want it to do there should be no second button. Without him, the iPhone of today could have been a very different beast. But that’s not the only change that was made. The book states that in an even earlier design there weren’t going to be any buttons at all. That sounds like a design that Apple might somewhat be returning to with the iPhone 8, as it’s rumored the home button will be absent, but with iOS 11 on board, plus a fingerprint scanner and likely all sorts of other tech, you shouldn’t be short of ways to interact with the device. For more secrets of the iPhone’s history, The One Device is out now in the US for $19.04 from Amazon and launching on June 22 in the UK for £13.60. The Samsung Galaxy S8 also did away with the home button.